Cup Noodles Museum Yokohama – Best Instant Noodles! There Really Is A Cup Noodles Museum! Japan is the home of cup noodles! 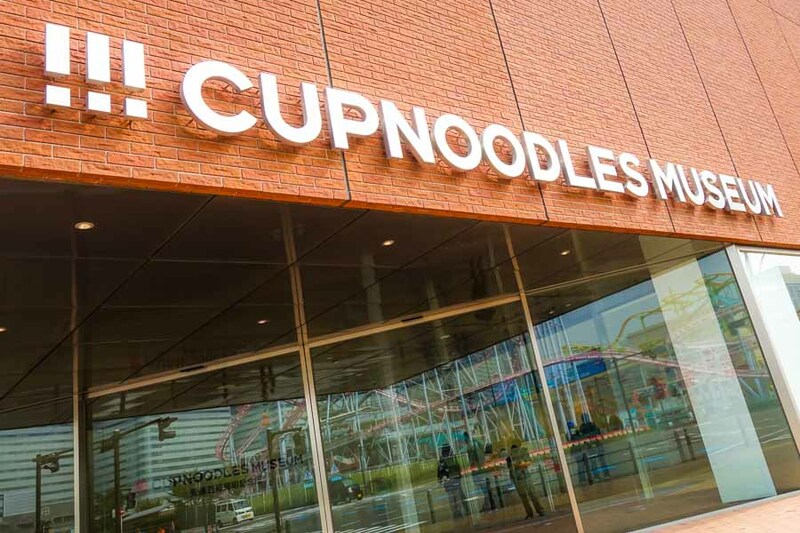 So naturally, as a fan of this amazing food you need to visit the Cup Noodles Museum Yokohama! You get the dream, the story and the results! A story of inspiration and innovation! If you’ve ever had a cup, you owe it to yourself to check it out in Japan and make your own custom cup noodles flavor, see their history, play in their park, make noodles from scratch and eat at their international noodle food court. When I got there it was surprisingly awesome! From the outside, it’s located in a very popular area in Yokohama. There are malls and amusement parks in the area, although it’s still about a 10 minute walk to any subway station. I decided to go here around 5pm and found out by that time they were already sold out on museum passes. They close at 6pm! Plan accordingly! Determined, I went back the next day at 10am when they opened. I went to purchase a ticket and found out there were several options. The museum entry fee is mandatory and there’s an optional fee to build your own custom cup noodles flavor. To me that wasn’t optional, that was mandatory experience for life. There was an additional experience for making noodles from scratch, but that looked like more work than fun from the expressions of the people I saw in the experience. Additional tickets can be purchased any time and there’s a schedule if you want to go on the English version. The actual museum part was very inspiring. It was about these guys selling noodles (very competitive) and revolutionizing the experience by making it quicker, cheaper and more portable. This was critical for people during the Japanese depression when money had to go a long way. I ended up leaving inspired by their innovation. On the top floor there is a children’s play park and a food court. There’s also a balcony where you can get a nice view of Yokohama bay. It’s another 300JPY for the cup noodles container to build your own. It seems like there wasn’t a limit to how many you can build since that part wasn’t regulated. After getting your cup, you sanitize it, draw something cool, fill it with ramen, ingredients and then seal it. There is an expiration date so you do have to eat it within a reasonable amount of time. I ate my noodles a week after getting home…and it was tasty. I love instant noodles, but only at home. Getting instant noodles at a restaurant seems like a waste…especially in Japan. Since there’s so much fresh high quality noodles. But if you go and you have a chance to make your own custom best instant noodles, you should! Ehhh…it’s all “okay” food. Small bowls of different styles of noodles from around the world for 300JPY. I ate 3 different bowls from several of the vendors. I didn’t finish any them since they weren’t that good. The ambience of a street alley “of the world” they built is pretty nice looking, so that part is worth checking out. BUT, I wouldn’t recommend having a full meal there since you could eat full on tasty noodles at place like Ippudo, Ichiran or Tenkaippin! Pingback: Mayor, Governor Join Hands To Make Osaka 'A Global City' | StudHouse - интернет-агенство помощи студентам! Pingback: Rugby World Cup 2019 Travel Guide | StudHouse - интернет-агенство помощи студентам!